The introduction of Karting Australia’s new timing system is on track for 2018 with the first training session being conducted in Perth, Western Australia last weekend. 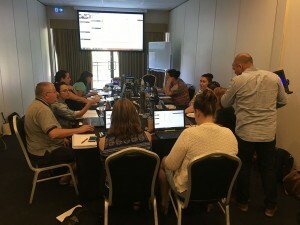 12 representatives from Western Australian Clubs were in attendance to receive a clear understanding of the mechanics and benefits of the MYLAPS System and Orbits 5 Software. The training will continue later this week with MYLAPS staff presenting training sessions in conjunction with Karting SA and Karting Victoria. Karting NSW will host a training session on the first weekend in December and Karting Queensland in January. At the completion of this training schedule, and subsequent webinars, more than 70 volunteers will have a suitable understanding of the MYLAPS Orbits 5 software in preparation for the introduction into Karting Australia competition at the start of 2018. With the exception of four, all Karting Australia affiliated Clubs across the Country have elected to take up the opportunity to be supplied the new MYLAPS System and Orbits 5 Software at no cost to their Club or Members. Only Cairns & District Kart Club, Ipswich Kart Club, Oakleigh Go-Kart Club and the Mackay Kart Club have all elected to purchase their own system at considerable cost to their Clubs rather than accepting the free hardware and software from Karting Australia.